Vicky is available to give talks to societies, gardening clubs and other interested groups. Talks last for approx. 45 minutes to 1 hour (nearly always 1 hour unless requested otherwise) depending on what you require. Our gift vouchers come in £5.00, £10.00 & £20.00 you can purchase a hand made card to put them in for a futher £2.50 if you should wish. We will bring plants for individuals if they order in good time. 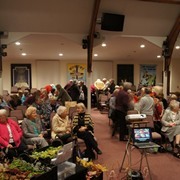 We can give talks at the nursey for small groups 10 – 24, 40 max (if there is a bigger group we do talks in 2 groups). This includes a coffee and a piece of home made cake on china crockery. Enjoy short power point presentation (approx 15 – 20 mins) only given on the nursery visits. Then you are free to wander around our small private garden. Look around the nursery. Where you can purchase plants. Take a look around our 3 national collections of Heuchera, Heucherella and Tiarella (which can be found in the garden and on the nursery). Look through all the medals and lots of other interesting bits and bobs from the shows. Lots of fun and very informal. Demonstrations and nursery workshops also available on request for groups. If you are interested in talks or demonstrations please call 01270 820335 for more details. Please take a look at the list below you may pick any talk you fancy. If you have already had a talk from us in the past please let us know which one you have already, so I can make sure your next talk isn’t duplicating anything much. We like to keep it interesting and fresh. This 1st talk we are usually asked to do as it takes you from the beging to present. 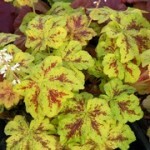 Of course there are lots of Heucheras, Heucherellas & Tiarellas too, including whats new. From Nursery to the shows and back home again. Showing you all the stresses, strains, and fun of the shows. Lots of behind the scene info etc. You get to see exactly what it does take to get a display looking good. 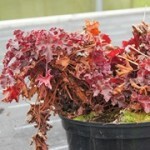 Of course still lots of heuchera info, including new varieties. All the build up and preparation then at the show and press day when the queen arrives and then to gala night which is full of champagne and plants. 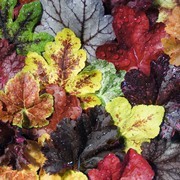 All you wanted to know about heucheras and even more. How to grow them well, pests and problems, ideas on planting etc. 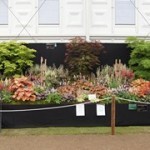 Of course we will look at some of the best and all the newest varieties for the year ahead. Heuchera, Heucherella, & Tiarella – A need to know even more! 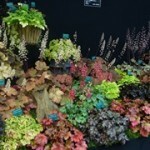 Tips & hints & lots of interesting heuchera stuff that heuchera addicts can’t possible live without.